The paper below describes the history and aesthetics of Japanese Pottery, termed Wabi Sabi. It is a look at the culture that built the idea that the imperfect and the fleeting are beautiful, and yet has cultural expectation that are quite the opposite. This paper was done for this CSU History Thesis course "How to Be an Emperor" by John Didier. 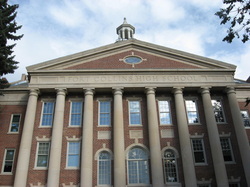 A look at Neo-Palladianism through researching the history and new growth of the "Old Fort Collins High School" building. Done for CSU Art History Thesis Course. Below are some essays done while studying abroad in York, England. I studied art history, taking two modules called "The Age of Cathedrals" and "English Country Houses," taught by Prof. Christopher Norton.